although there’s less daylight now (the sun is out at 8:30 and goes down at 5), the days lately have felt so. incredibly. long. why? i woke up to horrible news a few nights ago that there was another shooting in the usa, except this one was in a city that’s a fifteen minute drive from where i grew up. i came a across a clip of a victim’s father doing a public interview and shamelessly crying out to God for comfort. the only thing i could do is roll over to my side and and sob because i could feel a tiny bit of his pain. not this again. what kind of world are we living in? people are now becoming desensitized to the mass shootings, but every time i watch interviews of victims’ parents, i can’t help but imagine the precious moments i’ve had with hudson and taylor, their beautiful joy, the privilege i’ve had to watch them grow, and the deep deep love i carry for these children. one interview i saw recently featured a heartbroken and devastated father who also probably had so many of these memories of his son rushing through his mind that now bring unbearable pain more than anything else. what i do know is that there is a God out there who has felt that exact pain for the sake of being able to love me and you. so when that father in the interview cried out for comfort, i knew that my God knew exactly what that unimaginable pain felt like, and will be there to empathize and to bring light, as he has done with all pain in due time. i pray, never to hudson or taylor or anyone’s children that you or i know, but i’m sure the hundreds of parents of these victims had prayed the same. i can’t tell you where the light at the end of the tunnel is or what kind of good can come out of these mass shootings. however, what i do know is that i see my generation becoming more courageous, resulting in moving local level gun control policies in a more favorable direction. i can also see a world in which God will use the new leaders who have recently been brought into congress to bring broader changes. 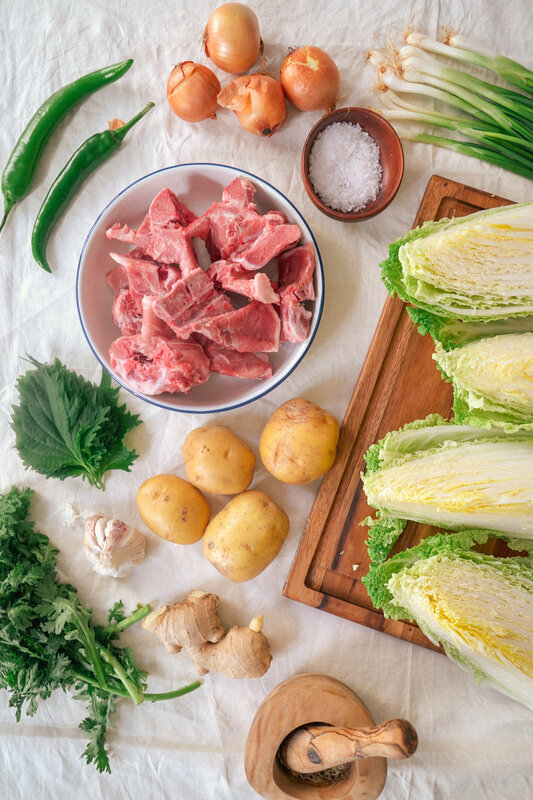 i’m sure you find it funny and super irrelevant that i’m writing about gun control over a korean pork and potato stew recipe…and haha, you’re absolutely right. there is no connection. the only way they’re connected is that it when there is no sun and it’s raining outside (and inside my heart. 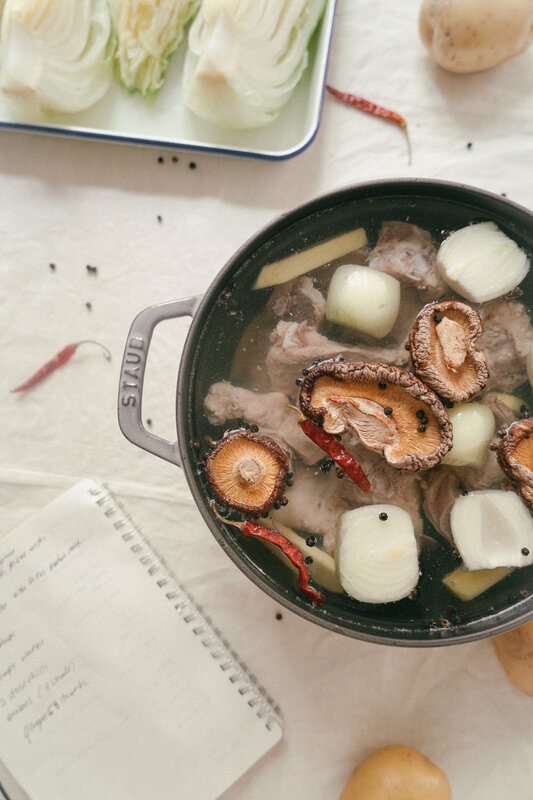 #emo), cooking a low and slow comforting stew can help you better gather yourself if you’ve been completely swallowed up by your thoughts. i’d highly recommend it and hope that your soul is somehow soothed by this gamja tang’s meaty broth. give the pork meat a good rinse under cold water and pat dry using a towel. set out on a platter and toss meat in kosher salt. set out for at least 45 minutes before cooking. place pork back into pot with 10 cups of water, dried chili peppers, onions, ginger, and soy sauce. bring up to a boil, cover, and bring down to a medium simmer. simmer slowly for 1 1/2 hour. *storage tip alert: if you have a ton of leftovers and you need to store for 1+ days, remove as much vegetable from the pot and set in a separate container. that way, the vegetables won’t soak up that precious broth and won’t get as soggy. when reheating, heat the broth and meat up first, and then add in the vegetables/greens.